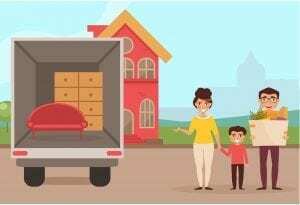 When preparing to transport a large number of things or oversized pieces of furniture, several things need to be considered when it comes to completing this move. One part that is often overlooked is how you plan on loading your property into the moving truck. Now, this may not seem all that important to think about, but improperly packing your vehicle could lead to added time in moving, cost you additional trips with the truck, or damage to your property. Let’s take a look at the best way to load a moving truck for the move. Collect your necessary packing and moving supplies, such as boxes, packing tape, a moving dolly, furniture padding, and tarps to cover your items, and straps to secure your property in the truck. Next, make sure to load kitchen appliances, as well as your washer and dryer into the moving truck first. Place them in the back of the moving truck against the wall closest to the cab. Keep these appliances upright and covered by a tarp. Load the furniture next, making sure that they are sitting upright. Then, cover them with mattress and furniture pads. Disassemble bed frames and tables and place them near the table tops or mattresses. Secure the items to each other or the truck with bungee cords or rope. After the furniture and your larger items have been, you can start loading the packed boxes. After this, place any fragile items, like plants and unboxed lamps last on the truck. Make sure your items are thoroughly packed, and not a lot of movement is present in it. This will make sure that your things will not collide with each other, and that you are utilizing all of the space present in the truck’s interior.